Letter G is for GORILLA Week is Next! 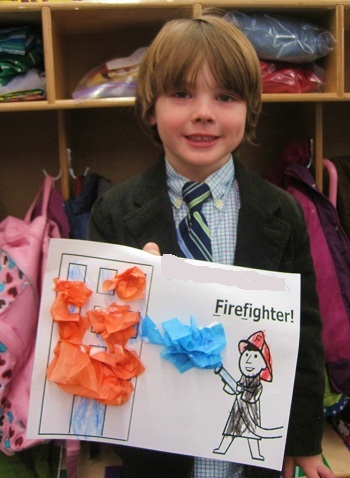 “Letter F is for Fire Safety Week” was not only fun, it was fiery, funky, funny, and certainly fun-filled! Read on below to see all the fun and learning that took place! Fire Safety Week began on Monday with a Full share box! 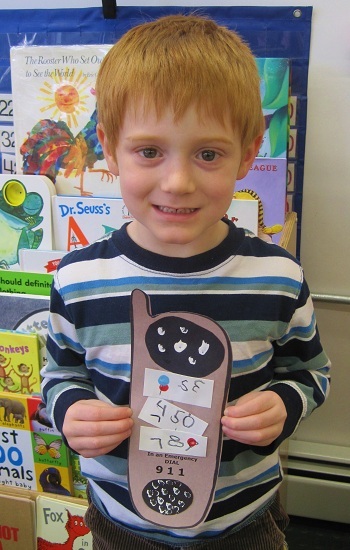 The students continued to fill the share box with letter F shares throughout the week. By far, the most authentic share came from the student below who brought in a firefighting helmet that his grandfather wore while working for the Fire Department of Jersey City! In the morning on Monday and Tuesday, the students practiced writing/tracing the letter F by working on their Letter F activity papers. 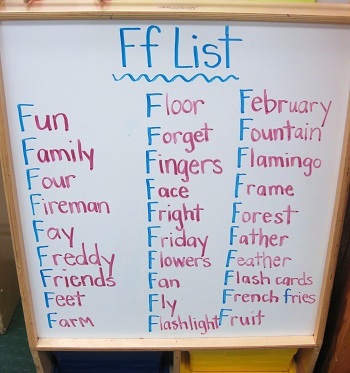 During the afternoon on Monday and Tuesday, the students created a letter F list. Things got a bit funny when the students suggested words like phenomenal for the list. Despite a few tricky words, the list was created! They also hunted for “F’s” all around the classroom! 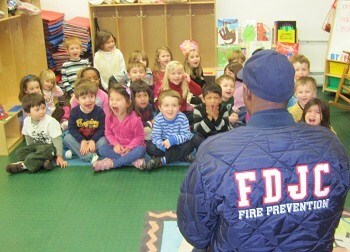 The students spent all day on Wednesday discussing fire safety! Of particular focus was the people who help protect us from fire – firefighters! Using crayons and tissue paper, the students spent their morning crafting an art project that captured a brave firefighter in action! Take a look below! Something fantastic happened on Wednesday at lunchtime. 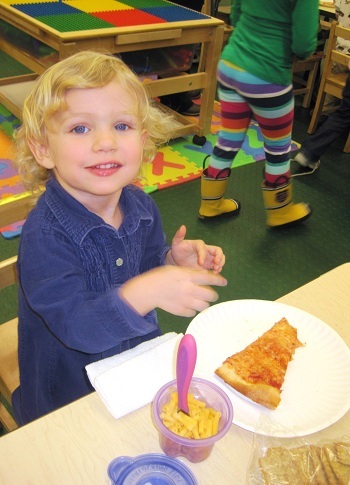 Since all of the Monday/Wednesday/Friday students have graduated from wearing Pull-Ups to wearing Big-Kid Underwear, the teachers treated the students to an All-In-Underwear Pizza Party Lunch! Needless to say, the students were filled with anticipation, eagerly awaiting the delivery! Finally, the moment had come – the pizza was here. 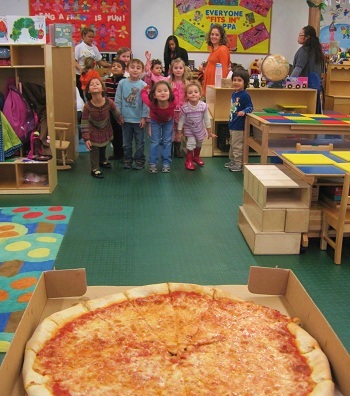 Take a look to see the students breathlessly waiting for their cheesy reward! Wednesday afternoon, the teachers led a discussion about Hanukkah, the Jewish holiday which began at sundown that evening. With the help of several students who celebrate Hanukkah, the holiday was explained and a few of the different customs associated with celebrating Hanukkah were described. 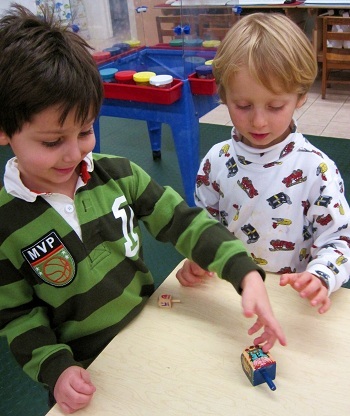 At the end of the day, each student had the opportunity to spin a dreidel and sing a Hanukkah song! It was clear – Hanukkah was a big hit! Happy Hanukkah to all the PPA families celebrating! 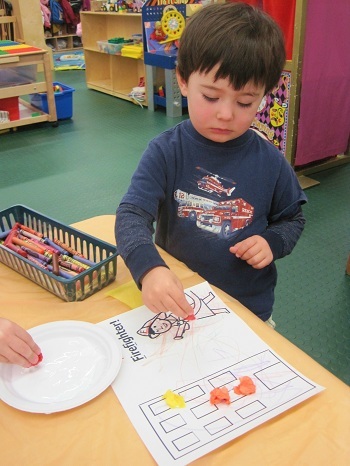 On Thursday, the students crafted their very own fire engine! 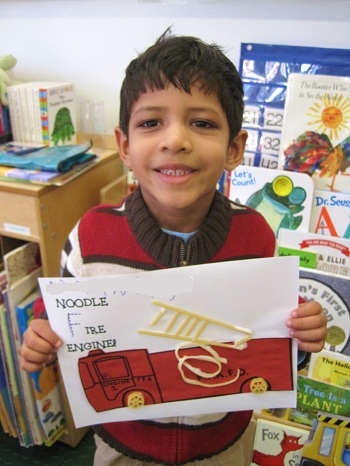 While the fire engine was red like a real fire engine, the parts of the engine were a bit different – made from PASTA! 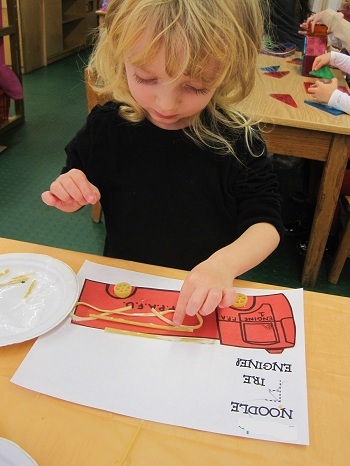 Look below to see how the students turned regular old linguine, perciatelli, and rotelle pasta into fire engine parts! While the art project looked great, the four year old student pictured above pointed out the inaccuracy of the project to the teachers. He asked, “Why does the ladder truck have a hose on it?” Recalling what he learned during the PPA Summer Camp firehouse field trips, he reminded the teachers that there are different types of fire engines with different purposes. A fire engine with a ladder is called the ladder truck and the fire engine with the hoses is called the hose/pumper truck. What a great observation! How astute the PPA students are! Thursday afternoon began with a technology presentation all about fire safety! The students learned a catchy song which tells them just what to do in the event of a fire! Listen below and enjoy! 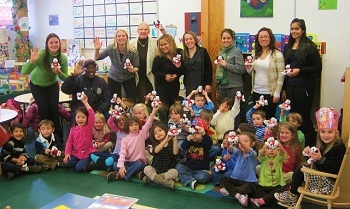 After the presentation had wrapped up, the students had Spanish class. They practiced identifying colors by playing the game – “?Que Color Es?” or “What Color is It?” The students listened to Miss Saily’s description in both Spanish and English to figure out which color she was thinking of. Can you figure out which color fits this description? 1. Este es el color del cerdo – This is the color of a pig. 2. Este es el color del flamenco – This is the color of a flamingo. 3. Limonada puede ser de este color – Lemonade can be this color. If you said, ROSADO (pink) then you are correct! Friday morning began with a technology presentation about a very important safety tip that can help keep people safe from fires and a lot of other emergencies – how and when to dial 911. After learning about 911, the students constructed their own telephones and then practiced dialing 9-1-1! They dipped their fingers in paint before dialing to show exactly which buttons needed to be pressed. Here is how the completed craft turned out! To help practice what to do in the event of an emergency, the students spent the morning role-playing different emergency scenarios. Watch the video below to see four students showing what to do in the event of an emergency. On Friday afternoon, Park Prep Academy was paid a very special visit by one of Jersey City’s bravest – JCFD Firefighter Mario Moody! The highlight of all PPA firehouse field trips, Firefighter Moody did not disappoint! 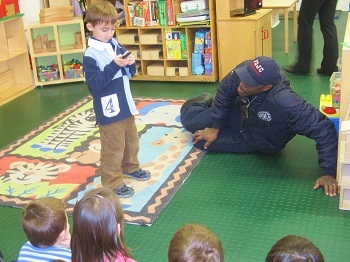 The students took turns informing Firefighter Moody of all that they learned about fire safety during letter F week. 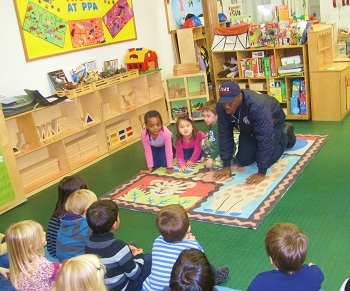 The students came up to perform various fire safety procedures like stop, drop, and roll and how/when to dial 9-1-1! It was clear that Firefighter Moody was impressed! Firefighter Moody then introduced the PPA students to one of his helpful fire friends – Sparky the Fire dog! 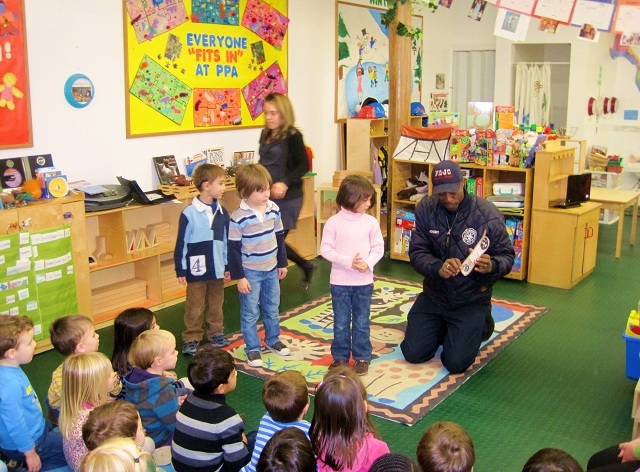 Sparky has an important job to help teach children how to stay safe from fires! Since the students did such an amazing job practicing fire safety, Firefighter Moody presented them each with a bunch of firefighter goodies! 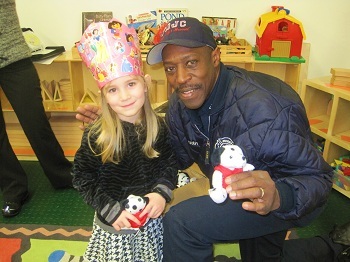 Each student went home with a JCFD fire hat, a JCFD fire pencil, a JCFD fire safety coloring booklet and crayons, a page of fire safety stickers, and even a Sparky! The students were thankful for all of the gifts from Firefighter Moody but they were most thankful for the service he and his firefighting friends do for the community! Thank you again to Firefighter Moody (and all of the local firefighters) for all that you do to keep us safe! Well, that is all for Letter F is for Fire Safety Week. As always, thank you for reading. Have a wonderful and safe weekend! Throughout the week, the teachers photographed the students practicing fire safety. Click here to see all of the PPA students as they Stop, Drop, and Roll! December 22, 2010 2:00 – 3:00 p.m.